300 g. pork meat, cut into one slice at least 1 cm thick. Soak the mushrooms in warm water. Boil the cotechino in salted water, having punched the skin with a fork, for half an hour. Beat the pork meat lightly. Remove the skin from the cotechino. Place the slices of pancetta on the meat and cover with the well-drained mushrooms. 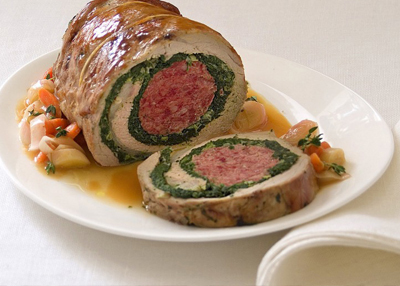 Place the skinned cotechino in the centre of the meat and roll up. Tie with kitchen string to make the filling and meat hug the cotechino and give it a sausage shape. Melt the butter in a pan with the oil and cook the meat. Salt, pepper and douse with white wine. Turn the heat down and cover, continue cooking for two hours, turning the meat every so often. Add a little hot stock if required. When cooked, remove the roll from the pan, remove the strong and leave to rest for ten minutes before slicing.